If you’ve been reading Office Snapshots long enough, you’ll know that we’ve posted images of Twitter SF before, but today I’m happy to have some official images and information of their Market Square headquarters from the architects; IA Interior Architects. 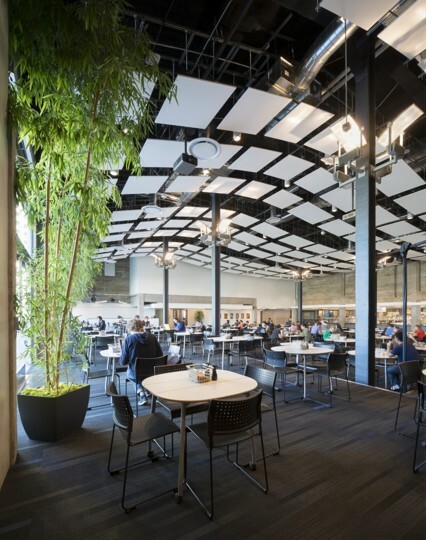 Twitter’s new global headquarters occupies floors 7-9 of the 11-floor Market Square complex, an iconic 1937 Art Deco landmark that once housed the San Francisco wholesale furniture mart. Until recently, the building, like the rest of its mid-Market Street neighbors, has been a casualty of urban blight. Twitter’s occupancy marks the beginning of a long-overdue renewal for the area, which is adjacent to some of the city’s most historic venues: Davies Symphony Hall, the War Memorial Opera House, the Asian Art Museum, and City Hall. Twitter’s desire to stay in the city where it was founded and a recently-passed San Francisco tax forgiveness measure inspired the company to commit to the area. This decision has subsequently attracted other tech companies to consider locations nearby. Twitter’s new headquarters is the first workspace designed specifically for the company, with the intent to reflect and nurture the Twitter culture, enable creativity, and appeal directly to Twitter’s bright and passionate staff. The multi-story location gives a new twist to the term “urban campus” and sets the bar for all comers. The space is subtly branded throughout with the use of the Twitter logo and signature blue, natural wood, and a frequent twig motif. The once cavernous open space, including the building’s original concrete columns, has become a great expanse of white benching systems, punctuated with informal seating areas, large and small conference rooms, break areas with pantries, banquettes, and easily reconfigured lounge areas, all complimented by art from local artists. A yoga studio, fitness room, and two very popular game rooms are also part of the mix. This variety of options takes full advantage of the huge floor plates and natural light at the window walls. The overall effect is edgy yet polished, complimented by an array of art by local artists.